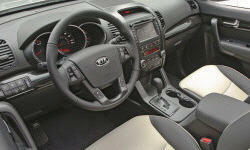 Kia Sorento Pros and Cons | Page 1 of 2 | Why Not This Car? What drives people to buy (or not buy) a certain car? 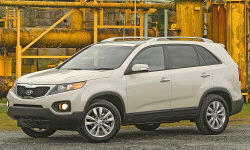 TrueDelta's members share Kia Sorento pros and cons based on their real-world driving experiences. Not a sports car, but solid. Got a family? Need space, with options for an extra kid or two? This car is a good all around family vehicle. I average about 22-25 miles/gallon, but only if I use a fuel addative every 5,000 miles. If not I get at best about 21miles/gallon. Great car for a family, snowstorm, and for its features. Wonderful warranty and cheap servicing costs. Bad gas mileage especially in start and go traffic. Bought this car because of the price, features, and warranty. Saw very good reviews posted elsewhere. Loved the styling more so than the competitors. So far haven't been sorry. 20,000 trouble free miles thus far. The exterior styling on the 2011 models was part of the reason I chose this car. Owned for 14 months and 15K miles with ZERO problems! No issues whatsoever! Quick acceleration (3.5L V-6), relaxed high-speed highway cruising; 6-speed, manually-shiftable automatic is unobtrusive and always in the right gear; automatic AWD can be locked in 4WD for maximum grip. The vehicle is fast and powerful. The ability to tow heavier amounts compared to other in-class vehicle is a definite plus. Also, it will do 13 second 1/4miles. Excellent Next-Generation 4-cylinder that offers performance equal to many 6-cylinders but with the smoothness and refinement that is really unbelievable. The manual 6-spd trans is also amazing and fun. It is a comfortable seat position to provide good all around visibility. V6 very powerful. Passing at highway speeds downright fun. Engine is smooth and very quiet. Efficient on the highway sips the fuel even with the full time AWD. Live at 7000 ft. so high elevation and mountainous terrain driving are common. The exterior is pleasing and the style is more aerodynamic than many of its competitors. new look and modern chassis. The exterior Styling is sleek and aerodynamic, not unlike more expensive models. Have over 62,000 miles and only now have a minor problem. The third seat was a major factor in our decision process.